If you want a laptop that can play graphically intensive games, you're in a tough spot. Generally you can opt for something crazy expensive but portable, or something hulking and a little but cheaper. 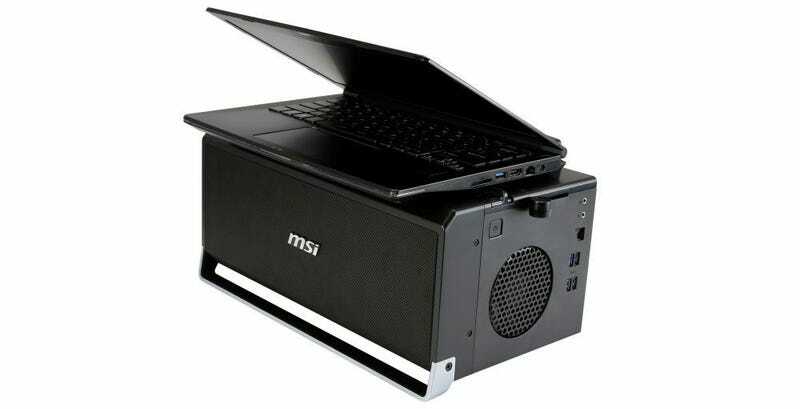 MSI's new GS30 Gaming Shadow notebook offers a middle ground: Take a slim laptop on the go, and plug into a power-tower at home. The GS30 Gaming Shadow itself is 20mm thick, weighs under 3 pounds, sports a 13.3-inch, 2560 x 1440 screen, 16GB of DDR3 RAM, and an Intel Core i7 processor complete with Intel Iris Pro integrated graphics. Intel's integrated graphics are getting better and better, and Iris Pro will get you through some relatively modern games jacked up to respectable settings, but it won't give you a real gaming machine. That's were the GamingDock comes in. It's bulky little sucker, but through the magic of a PCI-e x16 slot, the GS30 can plug right in and get the additional horsepower of a desktop card that you don't have to carry around with you wherever you go. The dock has also got HDMI and DVI out for an external monitor, plus some audio jacks for your speaker setup. The idea of docking a laptop to a desktop graphics cards isn't totally new, but the GS30 looks like a pretty seamless execution.